The good news is that you can start putting Baileys in your coffee a little earlier this year. The bad news is that another pivotal, longstanding design magazine bites the dust. 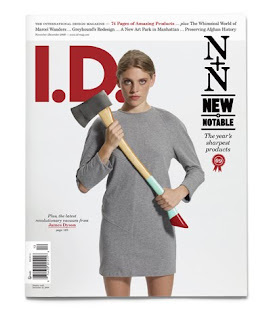 As an iconic representative of contemporary design, ID Magazine has folded after 55 years. The company will continue with the I.D. Annual Design Review and the international product design competition in an online format. Meanwhile, I.D. subscribers will be switched to its sister magazine, PRINT. Ecologically, economically– times are tough. I understand the accessibility and clean-cut appeal that online reading provides, but to surrender the experience of print is a sad thought. I think.. often it's all too easy to click online for updates and information. Magazines offer the option for an online or print subscription. Even novels are digitalized now. (No thanks) While I do love my bookmarked blogs and twitter updates, I think it is important to be mindful of the bigger picture. Times are advancing swiftly/surely and there is a general passivity regarding the priority of innate, human quality of life. I believe that getting away from the computer screen is important for the mind and body, and that flipping through a magazine or novel is a completely different experience from reading through a screen. It is tactile and truly a different engagement of the senses. Optimistically, I'm hoping we will see a revival in the numbers of print within the next few years. As we embrace the plentiful resources and easy access of the times, we do have choice in how and when we do it. Selectivity equals smarts.